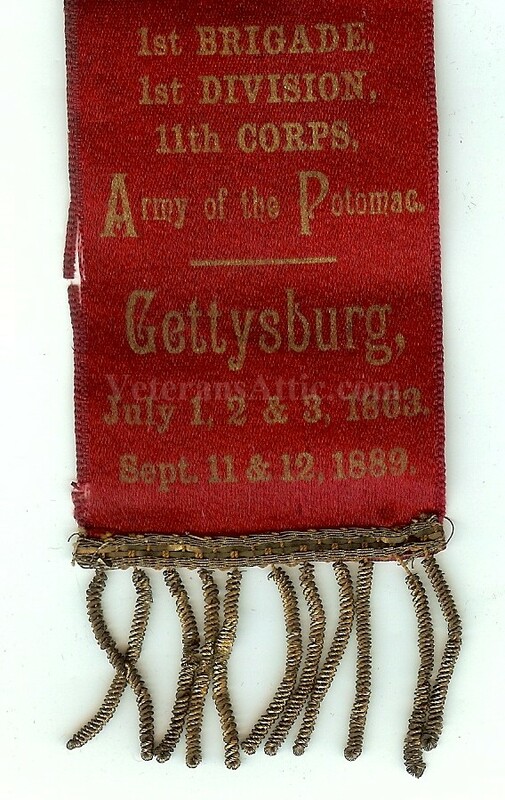 Offered is a great badge worn by a member of the 153rd Pennsylvania Infantry at their 1889 reunion held in Gettysburg. During the 1889 reunion they also dedicated the main monument to the 153rd Pennsylvania Infantry on the Gettysburg battle field so this badge was worn during the monument dedication! 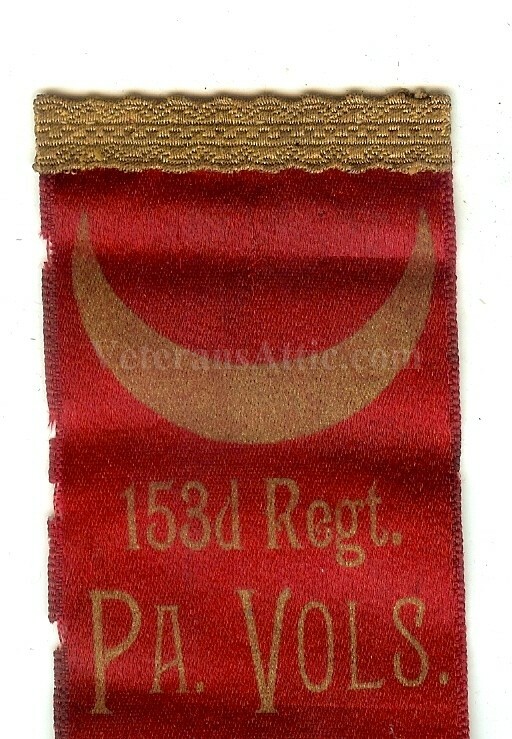 The badge has a gold colored cloth hanger attached to a red ribbon with gold metalic fringe hanging on the bottom of the ribbon. An 11th corps badge is in gold colored ink at the top of the ribbon. Written below the corps badge is "153d Regt. PA. Vols - 1st Brigade - 1st Division - 11th Corps - Army of the Potomac - Gettysburg - July 1,2,3, 1863 - Sept. 11 & 12, 1889". The ribbon is approximately 7 3/8 inches tall and approximately 2 inches wide. There are six nat bites out of the left side of the badge. The 153rd Pennsylvania Volunteer Infantry Regiment lost 1 officer and 48 enlisted men killed or mortally wounded and 28 enlisted men to disease during the Civil War. The regiment is honored by two monuments at Gettysburg. October 12 To Washington, D.C.and duty in the Defenses of Washington, D. C. Attached to 1st Brigade, 1st Division, 11th Army Corps, Army of the Potomac. November 28-30 Reconnaissance from Chantilly to Snicker’s Ferry and Berryville, Va.
December 9-16 March to Fredericksburg, Va. The regiment’s first experience of battle was Stonewall Jackson’s flank attack, with the 153rd at the extreme flank f the army. The regiment fired a single volley before it was flanked on both flanks and was ordered by General Von Gilsa to retire. It did so until reaching the open ground to the west of Chancellorsville, where it rallied. Colonel Glanz and 33 enlisted men were captured. Nineteen men were killed. Lieutenant Colonel Jacob Dachrodt, Major Frueaff, Captain Owen Rice of Company A, Second Lieutenant Conrad Reyer of Company H, and 53 enlisted men were wounded. Colonel Glanz returned from imprisonment but his health was too poor to resume command. The regiment was commanded at Gettysburg by Major John Freuauff. It suffered heavily in the fight north of town at the Almshouse on July 1, and again at the gates of the Cemetery on the evening of July 2. July 1. The Regiment held this position in the afternoon until the Corps was outflanked and retired, when it took position along the lane at the foot of East Cemetery Hill, where it remained until the close of the battle, assisting to repulse the enemy’s assault on the night of the 2nd. Carried into action 24 officers 545 men. Killed and died of wounds 10 officers 40 men. Wounded 7 officers 117 men. Captured and missing 46 men. Total loss 211. Second Lieutenant William H. Beaver was killed and Captains Theodore H. Howell, John P. Ricker, Joseph S. Myers, Henry Oerter and George Young, and First Lieutenants Benjamin Schaum, George W. Walton and Horatio Yeager were wounded.